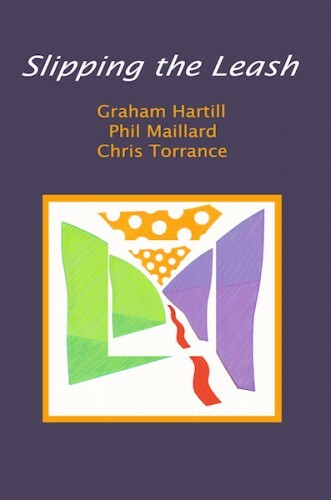 This book selects from the work of three much-published poets, Graham Hartill, Phil Maillard and Chris Torrance, who all moved to Wales in the 1970′s. It reflects their experiences of the landscapes, histories and people of Wales, and as such it is, in part, a gesture of gratitude for those experiences. All three tend to be identified with specific places – Torrance the upper Neath Valley, Hartill the Black Mountains, Maillard along the Welsh coast of the Severn – and have centred much of their writing around an investigation of location, often marked by a strong sense of the numinous. Each has been active, from the start, in terms of attitude and technique, in the bigger movement that has recently come to be called ‘The British Poetry Revival’. Their work is characterised, amongst other things, by an attentive openness to the immediacies of experience and a relish for experimentation with form, voice and perspective. Slipping The Leash was published in March 2015, printed by Dinefwr Press on bookwove paper, perfect bound with a full-colour cover featuring an image by the artist, Phil Morsman. FOR £20 YOU CAN ORDER A SIGNED EDITION OF THE BOOK, FEATURING A HANDWRITTEN POEM BY EACH OF THE POETS. Book launch will be at Hen and Chicks, Abergavenny on Saturday 11th July starting at 14.00.